When it comes to jewelery accessories, some things are as ubiquitous as the swirly pair of diamond dangle earrings. Flattering to every face and characterizing features, diamond hanging earrings hold the power of simplicity. Tagged as huggies, dangle earrings are set halfway around the outside of the hoop. Define a new wave of luxury by wearing oval shaped hoopoes that evoke a sense of charm. Dress up any wear and no single head will stop looking at you. Discover yourself as the fun, flirty (hallelujah) at any party, sport the look with the hottest fashion trends of diamond dangle earrings. Anyone out there who wants to come in the spotlight, what can be more sensible than picking up a diamond dangle earrings? dangle earrings for men or big dangle earrings, Medium or big sized, punctuate your confident look with the attention-getter diamond earrings from Jewels Queen. You know the occasion you are going to and that’s why you are here to match your outfit perfectly. Your charming beauty can be blissful in appearance when you want to show the feminine in you. If you wish to garner some attention and make a declaration about who you are, you are at the right place. Diamond drop earrings or dangle earrings are basically round jewels falling from the loop that simply reminiscing your free style outlook, feminine yet strong. At Jewels Queen, we will let you captivate each moments with our long dangle earrings that symbolizes a free spirit even your hair is locked or wearing your hair down. Also called as drop earrings, find selected range of dangles which are an essential piece of jewelry available in many different styles, from truly elegant to sport casual. If you are the BoHo chick, a nightclub diva or classy lady, our edgy, urban earrings include gold dangle earrings, silver dangle earrings and diamond dangle earrings. Check whether you have a long neck or a shorter one, accentuate with a pair of drop dangle earrings. For those who are seeking a special earring for the special occasion, our wedding earrings collection holds wedding dangling earrings featuring with bold accents of diamond or gemstones that will channel your desire. Choose from selections including gemstones set in diamond drop earrings to give a wonderfully elegant look. Also select a matching necklace and a diamond bracelet for the perfect set. Light up your evening gown and be flattered with our modern drop earrings. 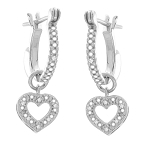 We have good range of wedding dangling earrings in gold & silver dangles. Our long diamond drop earrings & gold dangle earrings gives you enough freedom to choose the prefect wedding dangle earrings for the brightest day of your life - your wedding. Jewels Queen marks diamond drop earrings that sparkle and dangle from the ear for a laid-back look. Dangle earrings can go awesome with a pair of blue or black skinny jeans and a flirty blouse for a lunch out or for a shopping spree. For the ideal afternoon or evening garden part, you can also match the dangles with a flowing summer skirt and camisole. Buying diamond hanging earrings could be easiest jewelery purchase because you know you are beautiful. It comes in style that features many gems including ruby, amethyst, emeralds, etc. Combine with other stones or metals, you can wear it day or night and feel and look wonderful. Diamond hanging earrings whether the gemstones are round, tear drop, pear or another dazzling shape. From a T-shirt and jeans to a formal evening dress, these earrings are the great accompaniment. Offering stunning complimentary pieces, our online jewelry store has the direct access to sparkle your day at affordable rates. Find the perfect diamond drop earrings for any taste and style at Queen Jewels inc.